The South African Freedom Movement. The Black Liberation Movement. The Chicano Art Movement of the 1960s. The AIDS Memorial Quilt. The Black Arts Repertory Theatre. The skillful oration of Malcolm X and Akonadi’s President Lateefah Simon. The works of Octavia Butler, James Baldwin, W.E.B. Du Bois, Ai Weiwei, Maya Angelou, Toni Morrison, Kendrick Lamar, Sherman Alexie, Juan Felipe Herrera, and countless others. Time and again, we are reminded of the extraordinary power of art and culture to shine a fresh light on injustice, build solidarity, and help us imagine—and work toward—a better future for whole communities. Right here and right now in Oakland, hundreds of organizations, youth, and artists are using arts and culture to build voice, power, and self-determination in communities of color. Furthermore, what we love about the character of Oakland is that it has been molded by the culture, creativity, and resourcefulness of Black people, immigrant communities, and a culture of resistance, as evidenced by the Black Panther Movement and local youth organizing efforts such as BAY-Peace and East Side Arts Alliance. But there’s a problem. Increased economic pressures and displacement threaten the survival and vitality of many of Oakland’s community-based arts and culture organizations. Add the challenges facing small nonprofits everywhere—from staffing and fundraising pressures to shrinking government investment—and it’s clear that these groups need more and deeper support. Akonadi Foundation believes that racial justice movement building requires communities-of-color-led efforts to build power, shape policy, and strengthen culture. 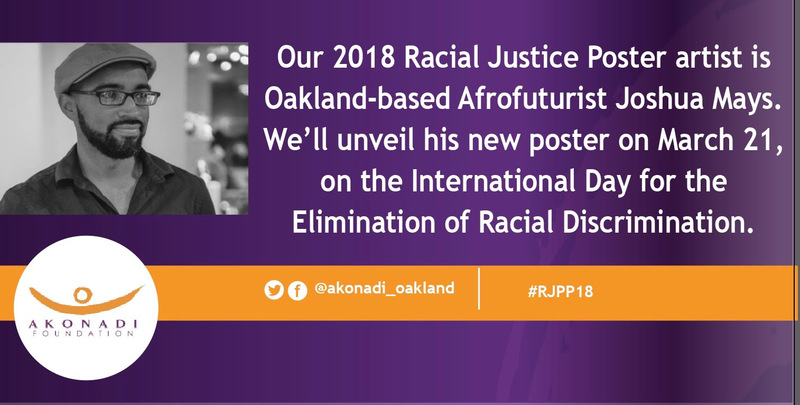 The Racial Justice Poster Project is one way in which Akonadi Foundation honors and inspires racial justice movement building in Oakland and around the world. 2018 marks our Racial Justice Poster Project’s 10th anniversary. We want to use this milestone to lift up the artistic legacy of racial justice movement building, paying tribute to the courage of artistic and cultural ambassadors engaged in the ongoing struggle for racial justice locally and nationally. We are excited to announce this year our featured artist is Oakland-based Afrofuturist Joshua Mays. Joshua’s murals are an act of storytelling inspired by looking to the future that we want to create, while also honoring lessons from our ancestors. His work often features images of women of color immersed in magical realism and science fiction. His murals can be found on several buildings in Oakland. We will be unveiling his poster, titled ‘Transmission: Received’ on Wednesday, March 21,the International Day for the Elimination of Racial Discrimination. The Racial Justice poster project ten-year retrospective will launch on Tuesday, March 21. All of the posters will be on display in the ground floor windows of Oakland’s beautiful Historic Central Building, streetside at 1417 14th Street. Many thanks to Jordan Real Estate Investments for their collaboration, and Oakland based production company, Civic Design Studios, for installing the window display. Akonadi Foundation’s mission is to eliminate structural racism that leads to inequity in the United States. 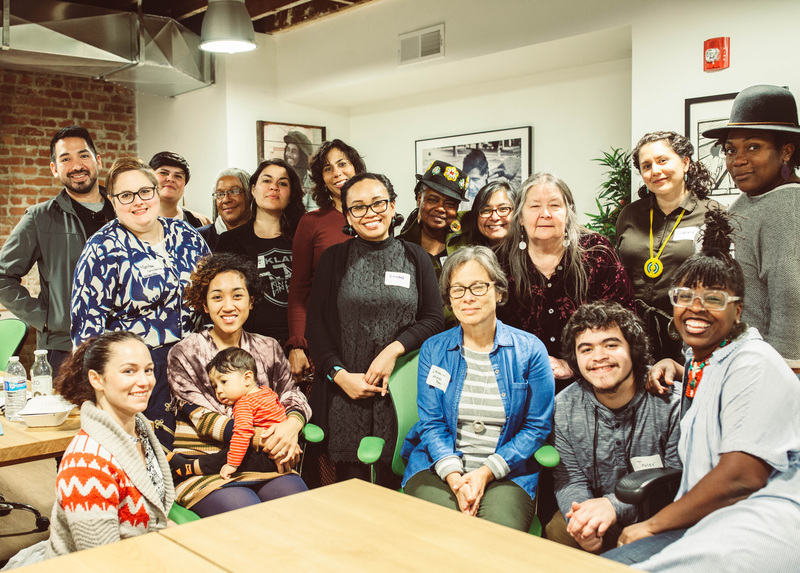 We work to support and nurture racial justice movement building in Oakland by funding organizations and leaders fighting on the ground through grassroots organizing, culture shift, and policy change. Find out more about Akonadi Foundation here.